Our family on Jax’s birthday…it was not a very joyous occasion. The first time Mom saw Jax, 4 hours after his birth. 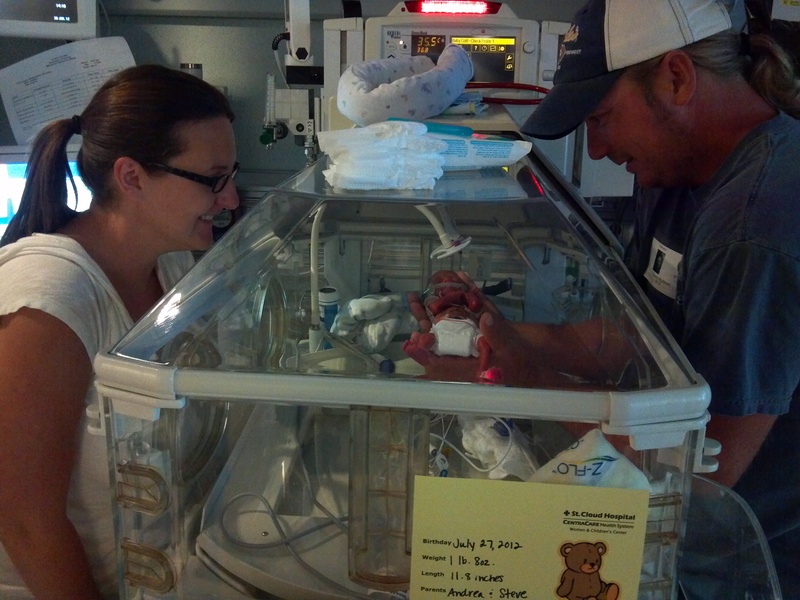 Dad went to the NICU with Jax right away. Our family three months later, on the day Jax was discharged from the hospital. Now that was a joyous occasion! He went home a full month before his due date, so he’s technically negative-one-month-old here. Jax’s discharge day was also his 3 month birthday! Our family today…with our hilarious face-making 9-month old stud-muffin. Thank you! I love looking at the difference between then and now. It makes me thankful for how far Jax has come! What a Beautiful Family! Thank you for taking the time to Share your life and stories with All of Us. Thank you, Teresa! I love being able to share all of Jax’s accomplishments – he’s such a strong baby and I think his story deserves to be told. Thank for reading! Love this Andrea, he is so amazing and your family is adorable!!! !